The PenJet project is a collaboration of Rietveld Academie students Jaan Evart, Julian Hagen and Daniël Maarleveld. The project has originated from the workshop “Uncommon Usage” given by Jürg and Urs Lehni. During this workshop we experimented with the movement of printer heads. 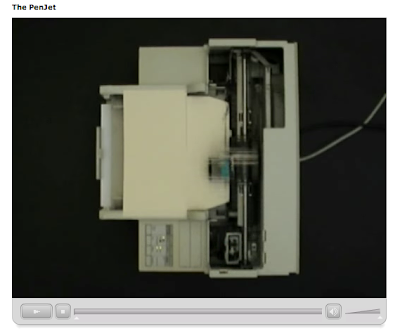 This resulted is a printer which could play a mini harp and another printer which showed the movement of the print head using an attached pen. In time we got more control over the movements so there could be experimented with type. And an adapted typeface for the PenJet emerged. Also adapted pictures where “printed” in several layers. In general it commonly applies that the new (in) possibilities of every new technique influence the design process. This is also the case for this new alternative of a printer. And therefore there was decided to continue the project outside this workshop. Every brand of printer has its own manner to move and characteristic rhythm. The Penjet shows the handwriting of the machine, some fine and straight, others messy and fluently. Also the quality settings of the printer (presentation/normal/concept) influence the way the lines are drawn. The final result has both the imperfections of handwriting as the preciseness of a machine. Every page is unique. How much control there is, the printed result remains unpredictable. The PenJet prints random connection lines while there’s nothing to print. The represented texts refer all to transition within production processes. On the endexam exhibition there was a print workshop arranged where could be experimented.